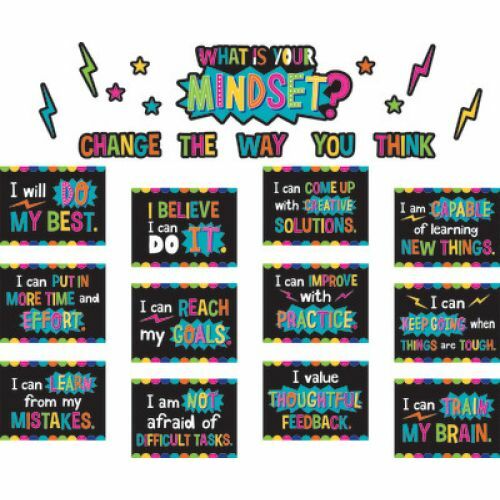 Teach students about the power of positivity with this growth mindset bulletin board. This colorful bulletin board is a great visual reminder for students that changing their thoughts and words can have a big impact on end results. 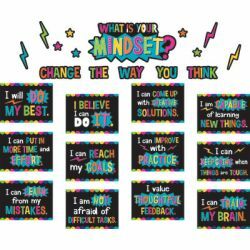 Each of the 12 posters measures 12" x 9" and includes a positive statement designed to build self-confidence and encourage student achievement. The "What is Your Mindset?" header piece measures 20" x 9¼". 28 total pieces.